← Scout. Anything less is just a car. If you’re a regular visitor of this site you now how it works around here. I tend to post articles relating to older trucks and equipment while sprinkling in some industry news for good measure. I don’t proclaim to be an expert in anything that I publish on this site but I do try to pass along useful information from time to time. Keeping those two concepts in mind my eyes nearly popped from my head when I began to read this article that Marc mailed me the other day. Like the Scouts from yesterday this article comes from a mid 70’s edition of Popular Mechanics. It’s titled Truck Spotting and gives a comprehensive view of the trucks, truck builders and industry as a whole as it was in the 70’s. There is a handy cheat sheet of truck grills including such makes as Brockway, Diamond -Reo, White and Autocar. Name plates now lost to us across the sea of time but still every day runners on the interstates of 1974. 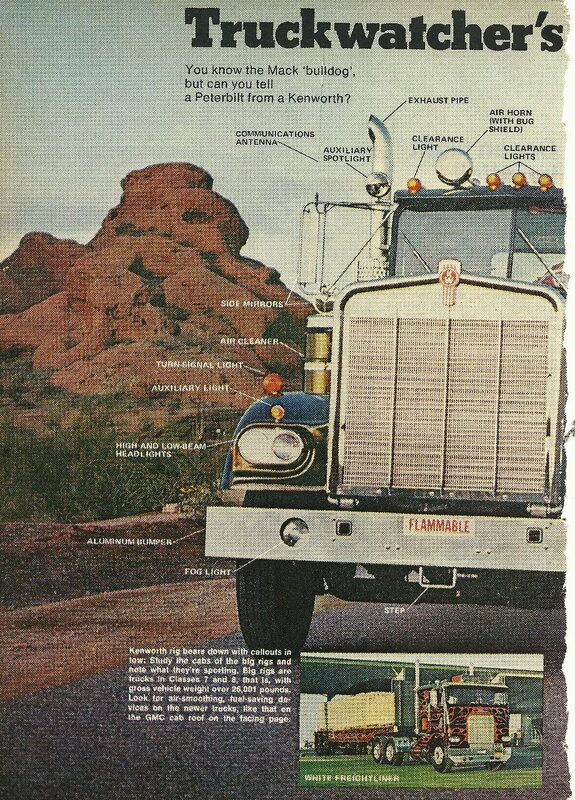 Much has changed since this truck spotting guide was published. As mentioned, many of the trucker makers referenced are gone while manufacturers like Freightliner and Peterbilt now offer their own diesel engines. Do yourself an favor and read this article, it is full of still relevant information relating to the basics of trucks and the trucking industry. Almost forgot, there is a great spot about Daytons vs Budd wheels. Which side do you fall on? Click any image to see a larger version. HUGE thanks to Marc for this one. If you’re on Facebook check out his RustedRelics and Just Classics groups. You won’t be disappointed. This entry was posted in Vintage Ads and tagged autocar, brockway, Diamond Reo, ford, freightliner, International, kenworth, Mack, peterbilt, truck spotting. Bookmark the permalink.